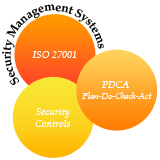 Certification of an organization’s Information Security Management System (ISMS) against ISO/IEC 27001 is one means of providing assurance that the certified organization has implemented a system for the management of information security in line with the global standard. Credibility is the key advantage of being certified by a respected, independent and competent third party. The assurance it provides gives confidence to management, business partners, customers and auditors that the organization is serious about information security management. ISO/IEC 27000 Part 1 is a Standard Code of Practice that provides an organization with default guidelines on the types of security controls an organization should implement to safeguard their assets. The scope of this standard covers all communication systems such as voice, internet, phones, faxes, etc. ISO/IEC 27000 Part 2 is Management Standard Specification which outlines the necessary steps required in establishing a management framework. It encompasses people, IT systems and the processes within the organization. The workshop includes exercises, case studies and role plays to help participants gain a better understanding on how to conduct an ISMS audit. Anyone aspiring to implement / audit ISO/IEC 27001 standard would benefit from this workshop. Prior knowledge on information security management and the ISO 27001 series of standards is desirable.